WASHINGTON — A push to delay a solicitation for industry bids for national security space launch services continues on, putting the Air Force in a tight spot as it prepares to issue a request for proposals for the Launch Service Procurement competition. Air Force leaders planned to release the final request for proposals (RFP) for the Launch Service Procurement (LSP) last week. Following a meeting with Undersecretary of Defense for Acquisition and Sustainment Ellen Lord on March 26, Air Force officials were hoping for Pentagon approval to issue the RFP but apparently that has been put on temporary hold. “No decision has been made,” Pentagon spokesman Lt. Col. Mike Andrews told SpaceNews on Friday. The LSP competition, which has been in the planning stages for years, suddenly is in the midst of a pitched political fight as industry players and lawmakers challenge the Air Force to level the playing field. The Air Force is poised to proceed with the final RFP in the coming weeks. At the center of the dispute is the Air Force’s decision to start evaluating proposals this year and select two suppliers in 2020 to receive Launch Service Procurement contracts. The two winners would split national security launch contracts 60/40 over a five-year period starting in 2022. The field of competitors includes national security launch incumbents United Launch Alliance and SpaceX, and new entrants Blue Origin and Northrop Grumman Innovation Systems. Blue Origin has asked the Air Force to consider pushing the decision beyond 2020 to allow more time to evaluate newly developed rockets that won’t be ready to fly until 2021. It also has argued that three, rather than two, companies should be selected for LSP Phase 2. The current plan, the company said, perpetuates the current duopoly in national security launch and puts new entrants at a disadvantage, contradicting the Air Force’s own rhetoric about wanting to broaden the industrial base. Blue Origin, which is based in Kent, Washington, gained a powerful ally in House Armed Services Committee Chairman Adam Smith (D-Wash.). In the latter Smith suggests that he is prepared to escalate the fight and take legislative action in the fiscal year 2020 National Defense Authorization Act. 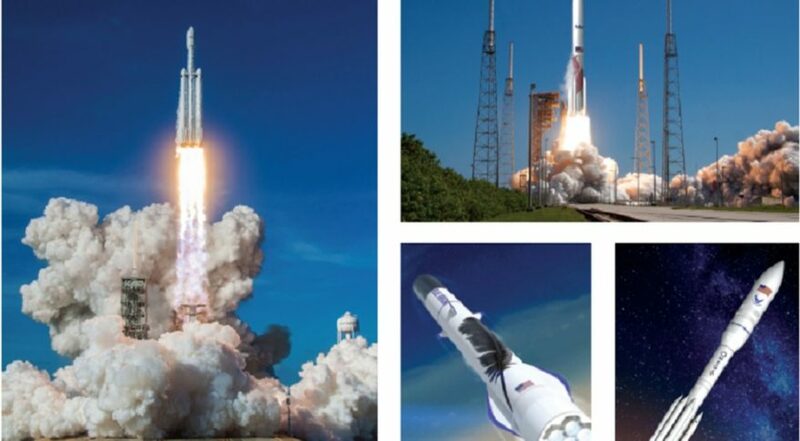 The Launch Service Agreements, or LSA, are cost-charing awards the Air Force made in October to Blue Origin’s New Glenn ($500 million), Northrop Grumman’s OmegA ($792 million) and ULA’s Vulcan Centaur ($967 million) to help pay for the cost of the infrastructure and vehicle modifications that are required for commercial rockets to be certified to fly national security missions. Under the rules of the LSA program, the Air Force will cut off LSA funding to the companies that are not selected under the LSP competition to receive launch contracts. That could effectively kick the losing suppliers out of the national security launch market for good. Industry sources who spoke with SpaceNews on Friday said both camps are digging in. They asked to not be quoted by name due to the sensitivity of the issue. “I think this will be part of the NDAA fight,” one source said. Whereas the Air Force is treating the LSP as a discrete procurement issue, launch companies and their congressional backers are casting it as an existential fight. Air Force leaders have reminded Congress that a legislative mandate to stop flying national security satellites aboard rockets that use the Russian RD-180 engine is the reason why the service has to qualify new vehicles sooner rather than later. During a hearing of the Senate Armed Services Committee’s strategic forces subcommittee, the commander of the Air Force Space and Missile Systems Center Lt. Gen. John Thompson said ULA only has 12 RD-180 engines in inventory that can be used for national security launches awarded between now and 2022. Congress five years ago set the 2022 deadline for the Air Force to stop using the RD-180 which is the main engine of ULA’s Atlas 5 rocket. Sources close to ULA said the company is fiercely opposed to any delay in the LSP competition and is miffed by efforts by other launch companies to use the legislative process to slow down the process. ULA’s rivals meanwhile are convinced that the Air Force is refusing to defer the LSP selection beyond 2020 because sticking with the schedule would favor ULA as an incumbent. Sources said the RD-180 issue could become an Achilles’ heel that ULA’s competitors could exploit to their advantage if ULA runs out of RD-180s before its new vehicle, the Vulcan Centaur, is certified and able to replace the Atlas 5 for national security launches. The company has been promoting its recent advances in Vulcan development to ensure the vehicle is ready for its first launch in 2021. If the LSP decision were pushed out, the source said, new entrants like Blue Origin would have more time to mature their vehicles and strengthen their bids.